On the Peak Tone 7 we arrive at the top of the pyramid, completing our first climb of Spiritual Growth for the 260-day Tzolk’in round. In each climb, we’re given the Truth we need to Know, Right Now. Our thoughts are always being prepared for the next Truth we need to Know. Tone 7 is a place of seeing everything that is and everything that is not. Only an Almighty Creator could make every part of the Creation Beautiful, down to the tiniest details. Yet, every detail would be unique in its own way. Out of all the snow that falls, no two were created alike. Human’s mind is open to all kinds of beauty, when we reflect on life from a Divine Perspective. 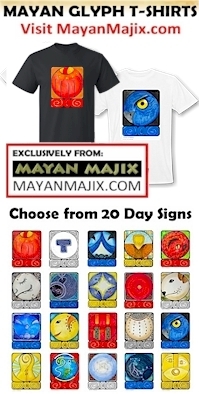 Deer/MANIK is the Day Sign that holds the Destiny of the Mayan priest. MANIK is also Known as Hand. The glyph illustrates the forefinger and the thumb of a hand grasping a thread of the Ether of Divine Spirit. (The forefinger and thumb symbolize “Direction” (the pointer), and “Will” (under our thumb). By our own Hand we complete a Circuit of Divine Power. In the Balancing Place of Tone 7, the Dreams from every realm of Being are Balanced in all Others. The Great Law of Creation is the Truth of, “As Above, So Below.” The Creation was designed to maintain it’s own perfect balance. The Dreams intended by our Movement are Offered to the Above. The Creator’s Dreams for us are Balanced in the Below. Our Time and Place in this Human cycle of development is in the nursery. We have been exploring our own new spiritual Body of Consciousness. We’re learning to move by intention. Directing movement is a primary Spiritual Development, the same primary physical development in Human. During the development phase of our Consciousness, a provision was made for Divine Intervention until we were Conscious. Divine Will would Intervene to do for us what we are incapable to do for our Self. Our Lives are always Divinely Sustained by the Creator’s Breath. We never have to learn to Breathe, nor the way the Body Heals Itself. These were Divine Inventions from the Above to the Below. Upon our arrival at the top of our pyramid, we can see new possibilities all around. We already Imagined our Future. Today our Heart’s Dream is measured for a Sacred Exchange. Our justice won’t be measured by an Intellectual or Material Accomplishment. We are all suited for our own task. To uphold the pillars of the world below, we live by rules and standards to measure the value of one another. We think we can then earn Love by following the rules. Above reflects an opposite Truth for Divine Measure. We wouldn’t have to Earn it. We would only have to Choose it. The Creator already Imagined the Sacred Exchange. Human’s Divine Measure would be the Choice to Know. The Creator Imagined the Exchange that would Multiply the Joy of Knowing these things. Human’s Happiness would not be fulfilled by Knowing our Gifts. Our True Joy lies in fulfilling a Divine Meaning and Purpose. Every Human Heart feels the tug of a Dream to be Remembered, to Know that beyond all our Human mistakes, our Lives Mattered to someone. We Dream to be Remembered by One other Human Being for whom our Life made a Difference. We aren’t fulfilled by fame. We just need One Human to See and Acknowledge the Best we were Reaching to Be. 7 Deer/MANIK demonstrates our Meaning and Purpose for Being Everything we Are. The Creator knew that a Living Consciousness would need something more than just the faculties of our mind. We would need our own Reason for Being. What is measured Above and Below is brought into Balance. We were creating the Means. The Creator was creating the End. Today we are made Whole as all our Means are given an End. Deer/MANIK is the Day Sign of the Mayan priest. MANIK lives a life of Service on Behalf of the Whole. MANIK was created to be the Hand of God on Earth, the physical creation of the One who will watch the nursery for others. We will become more like the Creator through a Loving Relationship. Children measure themselves by the Example shared by their parents. Deer/MANIK is the Day Sign in charge of all Spiritual Tools. All our tools of Consciousness were leading us to the same Meaning and Purpose the Creator Imagined, to Live in the Consciousness of our Divine Relationship with the Creator. Grasping the Power to Know is as easy as a Choice. When we are one in a Divine Circuit our Movement is aligned with the Creator’s first vibration of “Pure Love.” This pure vibration draws all lower vibrations into sympathy. MANIK resides in the West, guiding our Experience of the Unknown. MANIK holds the Element of Water, that holds the Ether of Spirit. Water is the Holy Element used by the priest for Baptism, Blessing, and Purification. On 7 MANIK our New Consciousness arrives for the first time at the Highest Altar. On Tone 7 we are given the eyes to see everything that is and everything that is not. Today, is the Baptism of Spirit that Identifies Who We Are. The Creator was waiting for us to gather our Consciousness so we could Know the Gift. Today we are recognized by Name, identified as unique as our own Perfect Part of the Whole. We would each have our own personal relationship as The Beloved. Deer/MANIK’s purpose is to uphold the Pillars of the Spiritual Realm in all the 4 Directions. MANIK upholds the Truth of the East (Inspiration), the Truth of the South (Relationship), the Truth of the West (Unknown Experience), and the Truth of the North (Divine Wisdom and the Wisdom of Experience). The Primary Role of the Mayan priest is to carry on the Observance of Sacred Ceremony. The priest keep track of the Meaning of Each Day. They performed the Sacred Ceremonies on behalf of the whole, as guided by the Signs Above. We are naturally drawn to the Sacred Fires of Ceremony. Our Heart recognizes a Place where we Know we are One. We always exist in Harmony and Equity when we are United in our Consciousness of the Creator. As the Master of All Spiritual Tools, Deer’s most used Spiritual Tool is Vigilant Observation in every direction. The glyph illustrates the Deer’s Eye on the Hand. Deer fulfills its destiny through its watchfulness over the Whole. In every community of Deer, there is One that Serves the purpose of MANIK, to extend the Hand of Divine Provision. The Happiness of the Whole is elevated by Knowing there is a watchful eye, someone who is always standing guard and will signal exactly when we need to move and which direction we should go. MANIK holds the energetic gift of Harmonic Resonance. This is the law of physics, balanced in Spirit, as the Pure Vibration that is capable to draw lower vibrations into sympathy. When we see Human carrying out a Divine Way of Being, we’re inspired to reach for it too. Today through a Reflection of Everything Above and Below, we are Initiated into the Consciousness of our own Meaning and Purpose. The Mission we are given is to Love. The Mayan priest doesn’t round up or track down Humans to Raise their Spirits to Love. Deer stands in the Highest Integrity of the Pillars of Creation, leaving in tact our Sacred Right to Choose. Our Choice is our Highest Offering to Give to the Creator. On the traditional path, we were given a name in completion of our first major accomplish of Sacred Ceremony. On the shamanic path of the Andean tradition, the Elders taught us to claim a name only known to our Self and to the Creator in the realm of Divine Consciousness. The Creator Knows us by the name of The Beloved. In the Hawaiian language this name, Ka Hiwahiwa, means, precious, beloved, esteemed, darling, indulged. favorite. Ka Hiwahiwa a ke Akua means the Greatest and the Last, the One Identified as the Savior by the Choice to Know God. To all my relations, may we Acknowledge a Divine Purpose for the Gifts we were given. May we Know that the Divine Wisdom newly awakened in us, will be Completed by the Hand of the Creator. My we be steadfast in our Purpose to exist in the Communion of a Divine Relationship. May we stand in the Truth of Love, knowing our demonstration will speak more about Love than words can say. May we Know our own Gifts of Direction are demonstrated by MANIK, who dispels negativity, by turning to the Direction of Love. May we See and Acknowledge the Hand of God working in our Life. As we bring the Offering of our Choice to Know, may we Receive with Gratitude our very own Reason to Be. The Creator looked into our future before we were born and Imagined how our Life would Matter. Our Creation will end with the signature of identifying us by all the Beauty We Loved on Mother Earth. May we Remember to Observe this Season of Miracles, when our darkest days are coming to their end. May look to the Solstice as a Sign in the future, marking a new cycle of Solar Light. May we anticipate that an Increasing Light Above as the Daily Sign of a New Illumination Below. May we Know that every moment matters in our Relationship with the Creator. Deer/MANIK (Hand): Deer are spirit tools. Silence itself is a spiritual experience for Deer. For Deer life is a pilgrimage. Deer are dominant persons who defend the people and will make sacrifices for others. The spirit of Deer upholds the pillars of the four directions. With the power inherent in the number four, Deer pushes away bad influences or negative energies. Skill and quality of work are very important to Deer. They are presented with tools for every task in life and it is with these that they are able to rise above limitations. Deer has a habit of keeping every tool it has ever used. This leads to clutter and indecision, loss and procrastination. When confronted with promises not kept, Deer becomes stubborn, manipulative and evasive. Cherokee, Deer/Ahwu’sdi: Symbolized by Constellation Galagina, the Stag, known as Taurus, the Bull. It does not include the Pleiades and Hyades clusters which in Cherokee are viewed as separate. To feed, gatherers of food and supplies, they enjoy rituals, ceremonials, feasts, the souls of hospitality, sociability. Freedom versus security issues often inspire leadership and unique solutions. Combined with artistic and inspiring energies in harmony with lunar cycles, they nourish the clans. Totem-Deer: A priest or shaman, a powerful person in general, to overwhelm an individual with one’s personal power, divination; inclined to become a teacher, healer, guru, civic leader, or politician. Ability to create harmonic resonance. Continued thanks for sharing the wisdom and knowledge of the ancestors to provide encouragement and directions for those who continue to strive to full fill our dreams and covenants with the Creator. I could not post my comment yesterday day and I am posting for 6 Transformer/CIMI and 7 Deer/MANIK. I continue to pursue my reactivation and trust in the Spiritual Gifts all Humans were given. And today’s journal is having a special impact because my birth sign is 1 Deer/MANIK. Clearly, I have much to contemplate and consider. Thanks again for your input and guidance. Blessings, Good Will and safety to you and all of my fellow followers during this Holiday Season.